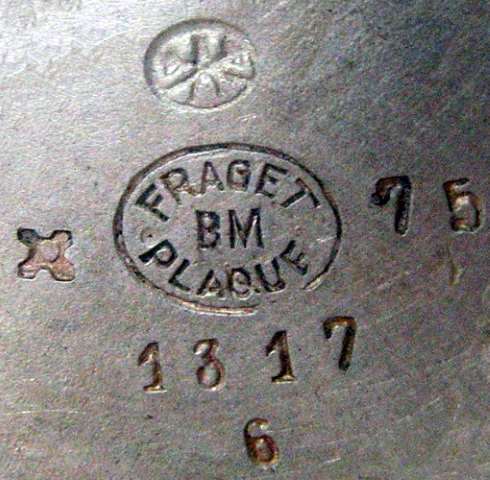 The Joseph Fraget silver plate company created a rather sophisticated system of hollow ware marks. Interestingly, there was no indication of the amount of silver used for plating (except in the early period 1824-1840). Instead, the applied technology of silver deposition (fusion-based or galvanic) was clearly mentioned. 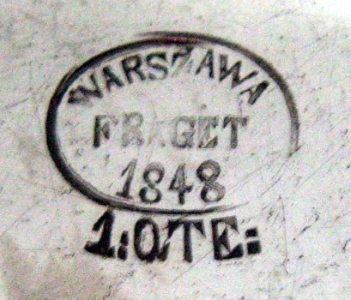 Warsaw c. 1854. Private collection of David N. Nikogosyan. The following list of marks is the most comprehensive one, available in literature. For the first time, it includes the hollowware marks of independent Poland. However, it doesn't contain either cutlery marks or so-called small marks, used in the case of the shortage of space for marking, i.e., when marking the bottom rim of a tea glass holder. This is certainly an area for a future work. 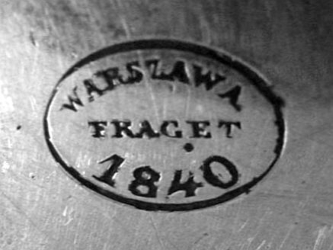 The earliest mark of Fraget company. It refers to fusion-based silver deposition (silver plating on copper base). 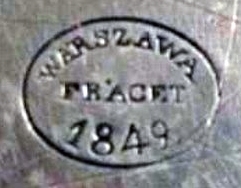 This mark consists of the two-line inscription made with a "serif" font in French "FRAGET A VARSOVIE" which means in English "FRAGET IN WARSAW". 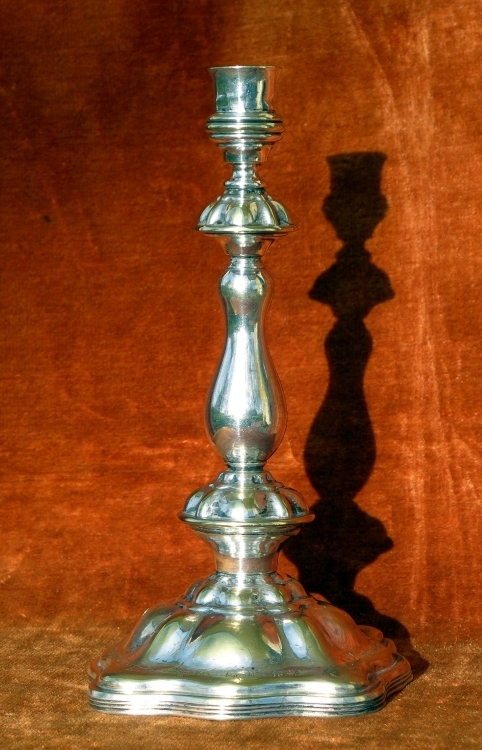 The additional word given in the "DOUBLÉE" means silver-plating from the both sides. The digit 10 means silver content (10 %). Very rare. The next mark of Fraget refers to fusion-based silver deposition (silver plating on copper base). 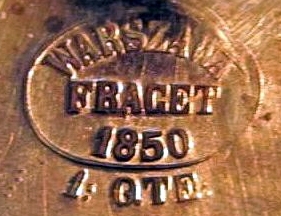 It has the inscription in Polish "WARSZAWA FRAGET" ("WARSAW FRAGET", the word FRAGET always made with a "serif" font) + the year of production inside the oval. 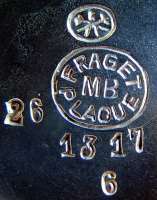 Since 1844 the French inscription "1 QTÉ" (shortening of 1 QUALITÉ, which means "highest quality") is placed under the oval. 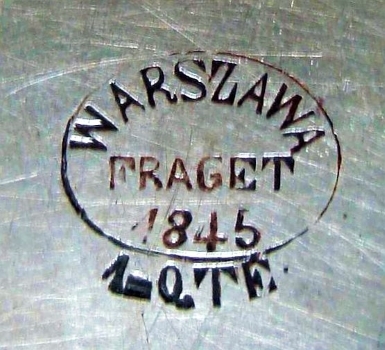 Small changes in writing of "1 QTÉ" inscription from year to year should be emphasized. Rare. Note. 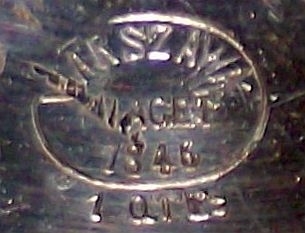 From 1844 the inscription "2 QTÉ" (shortening of 2 QUALITÉ, which means "middle quality"), was also used. Extremely rare. 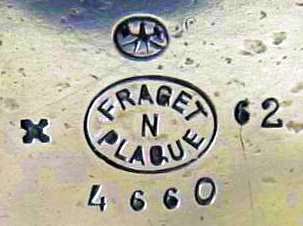 Next Fraget mark also refers to fusion-based silver deposition (silver plating on copper base). 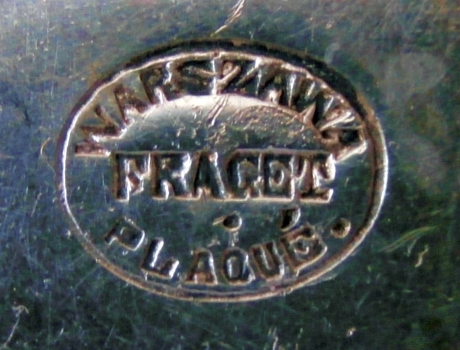 It has the inscription in Polish "WARSZAWA FRAGET" ("WARSAW FRAGET", the word FRAGET made with a "serif" font) + French word "PLAQUÉ" inside the oval. Extremely rare. 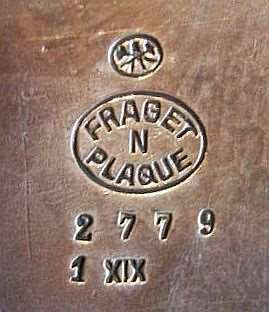 Next Fraget mark is the first one which refers to galvanic silver deposition (silver plating on brass/copper base). 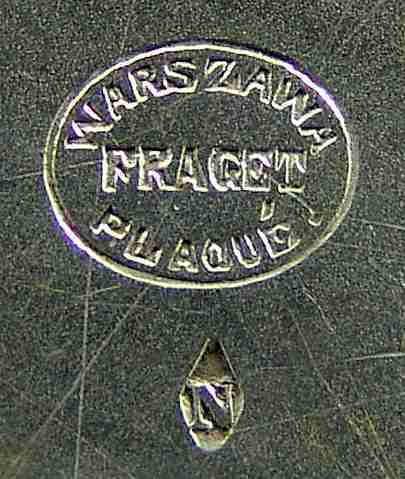 It has the inscription in Polish "WARSZAWA FRAGET" ("WARSAW FRAGET", the word FRAGET made with a "serif" font) + French word "PLAQUÉ" inside the oval. The usual size of the oval is around 4.9 mm x 8.2 mm. Note the presence of a dot (!) after the word "PLAQUÉ". Very rare. Next Fraget mark also refers to galvanic silver deposition. 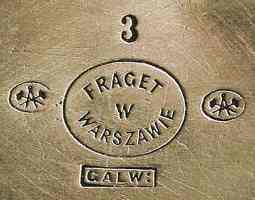 In comparison with the previous mark No.4 it bears the additional rhombus with "N" letter, which means "normal thickness of silver deposited onto the surface of the base metal" (usually on brass, sometimes on copper). 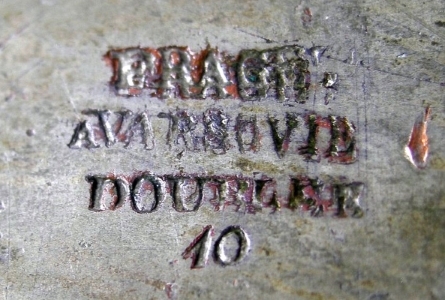 In the case of double silver layer, the letter "D" was used. Very rare. 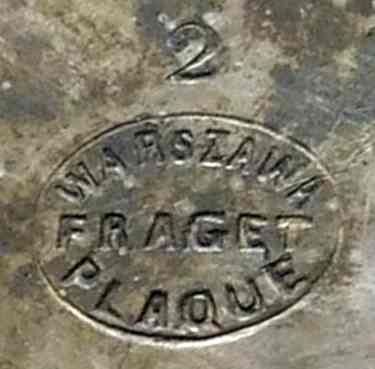 Next two marks, referring to galvanic silver deposition (silver plating on brass/copper base), were used during a short period and probably were dedicated to the factory jubilee (30 years). Their peculiarity is the use of "serif" bas-relief font for all the inscriptions. 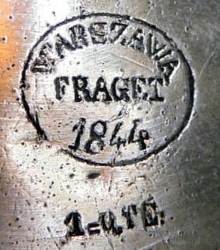 It should be noted, that both variations of this mark, with and without the dot, were used. Extremely rare. 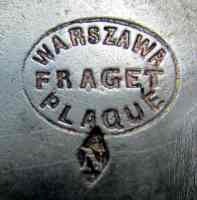 Another factory jubilee mark which refers to galvanic silver deposition (silver plating on the copper/bronze base). 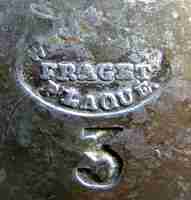 It differs from the previous one by the prolonged writing of the word "FRAGET". The size of the oval is 8.6 mm x 11.9 mm. Extremely rare. 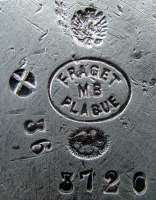 Another jubilee mark which refers to fusion-based silver deposition (silver plating on copper base). 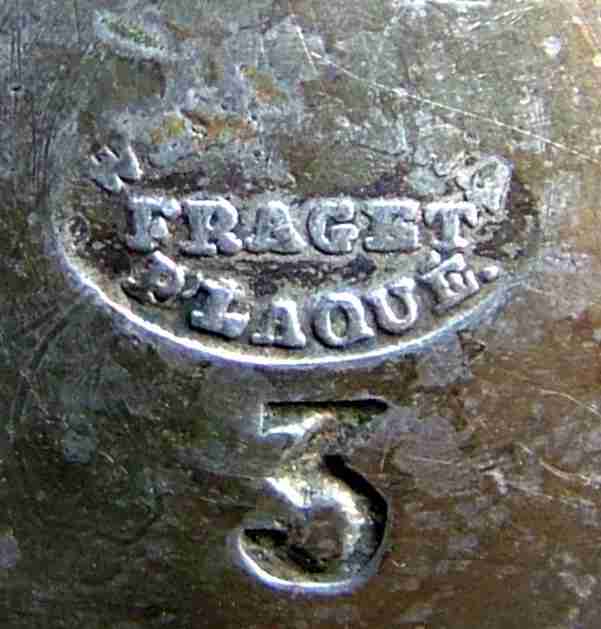 Similar to the mark No.3, but bears the prolonged writing of the word "FRAGET". In addition, all the inscriptions are made with "serif" bas-relief font. Extremely rare. 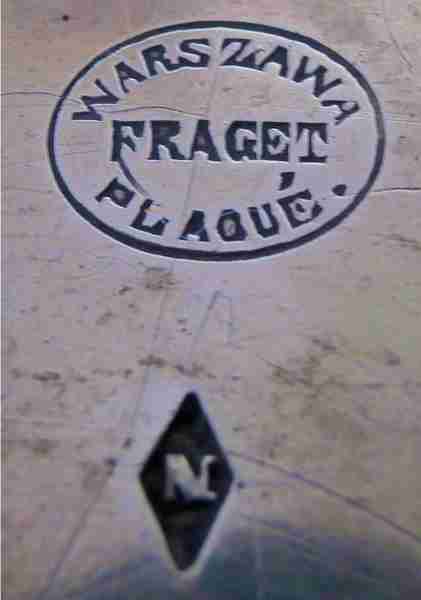 In all previous marks the FRAGET inscription was written with a "serif" font. 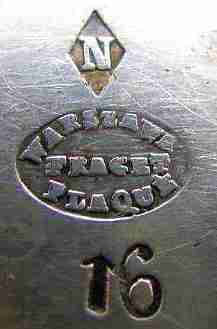 This and all following Fraget marks for fusion-based silver deposition use the inscriptions written with a "sans serif" font. 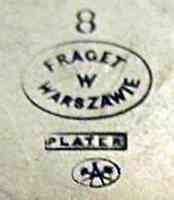 Otherwise, this mark is similar to the mark No.8. Rather common. A variation of the mark No.7 with all the inscriptions made with a "sans serif" font. 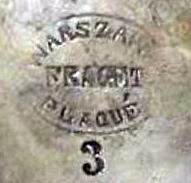 This mark refers to galvanic silver deposition. The size of the oval varies between 7.6 mm x 10.5 mm and 8.0 mm x 10.7 mm. Rather common. 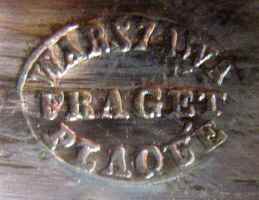 Next Fraget mark refers to fusion-based silver deposition. 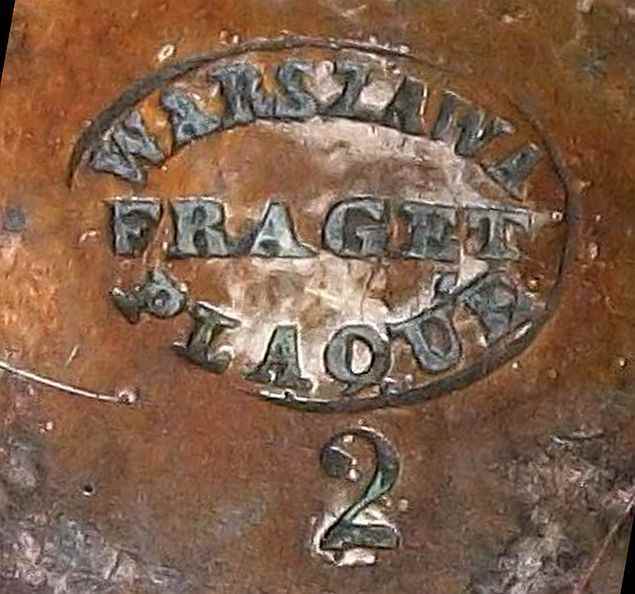 It consists of the inscription in Polish "FRAGET W WARSZAWIE" ("FRAGET IN WARSAW"), put inside the oval. 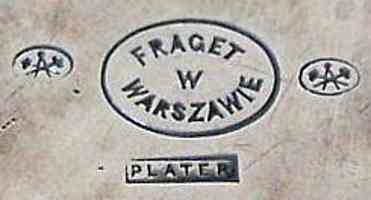 Near the oval is another Polish inscription "PLATER" ("PLATE"), put in a cartouche. Inside the small oval is the coat of arms of the coppersmiths' and bronze-smiths' corporation (two crossed hammers with a pair of compasses). Sometimes this sign is given twice. Rare. Next Fraget mark refers to galvanic-based silver deposition. 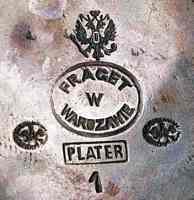 It consists of the inscription in Polish "FRAGET W WARSZAWIE" ("FRAGET IN WARSAW") inside the oval. The size of the oval varies between 7.5 mm x 9.9 mm and 8.0 mm x 10.4 mm. 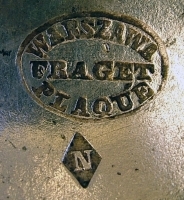 The rhombus (or the small oval) with "N" letter means "normal thickness of silver deposited onto the surface of the base metal (usually on brass)". 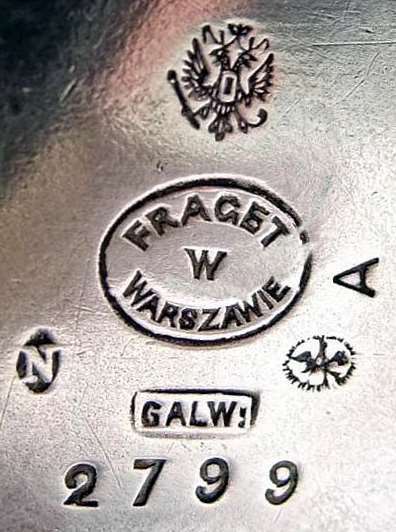 The inscription "GALW" in a cartouche is the shortening of Polish word "GALWANIZACJA" ("GALVANIC PROCESS"), explaining the method of silver deposition. Note the colon at the end of the inscription "GALW". Inside the small oval is the coat of arms of the coppersmiths' and bronze-smiths' corporation (two crossed hammers with a pair of compasses). Sometimes this sign is given twice. 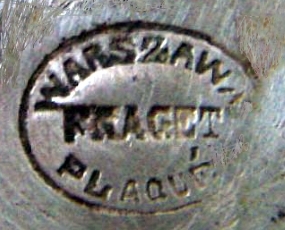 A widespread mark. 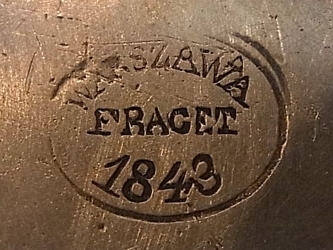 In 1896 the Joseph Fraget foundry got the privilege to use on its products the image of the Russian State coat of arms (a kind of quality award). 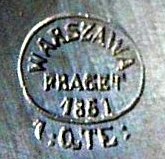 Immediately, new marks were introduced (see below). In addition, the marks of all unsold products were over-printed with the coat of arms of the Russian Empire (two-headed eagle). 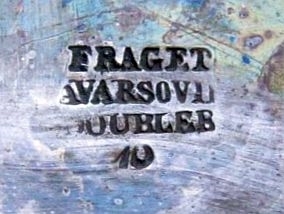 This Fraget mark for fusion-based silver deposition is the mark No.11, over-printed with the image of the two-headed eagle. The coat of arms of the coppersmiths' and bronze-smiths' corporation (two crossed hammers with a pair of compasses). Sometimes this sign is given twice. Rare. 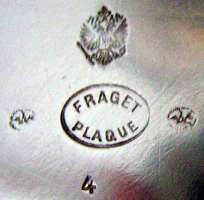 This Fraget mark for galvanic silver deposition is the mark No.12, over-printed with the coat of arms of the Russian Empire (two-headed eagle). The size of the large oval varies between 7.1 mm x 9.4 mm and 7.4 mm x 10.3 mm. The coat of arms of the coppersmiths' and bronze-smiths' corporation (two crossed hammers with a pair of compasses) is given once. Rather common. 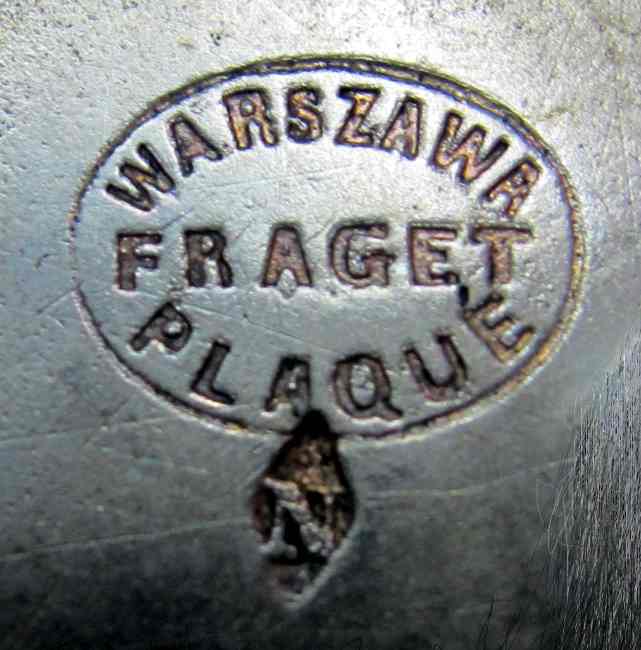 A very rare Fraget mark for marking the hollowware made by fusion-based silver deposition onto the copper surface. 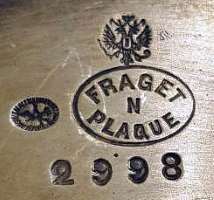 It consists of the inscription "FRAGET PLAQUE" ("FRAGET PLATE"), put inside the oval. Above the oval is the coat of arms of the Russian Empire - the two-headed eagle. Inside the small oval is the coat of arms of the coppersmiths' and bronze-smiths' corporation (two crossed hammers with a pair of compasses). Sometimes this sign is given twice. 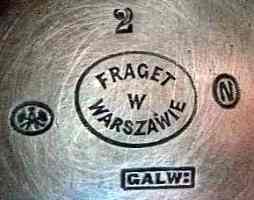 A wide-spread Fraget mark for marking the hollowware made by galvanic silver deposition. 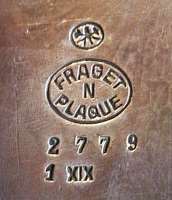 It consists of the inscription "FRAGET PLAQUE" ("FRAGET PLATE") inside the oval. The letter "N" in the centre of the oval means "silver deposition onto the brass surface". The size of the oval varies between 5.2 mm x 7.9 mm and 7.3 mm x 10.5 mm. Above the oval is the coat of arms of the Russian Empire - the two-headed eagle. Inside the small oval is the coat of arms of the coppersmiths' and bronze-smiths' corporation (two crossed hammers with a pair of compasses). 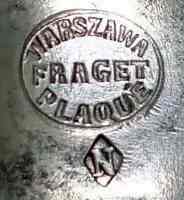 A rare Fraget mark for the hollowware made by galvanic silver deposition. 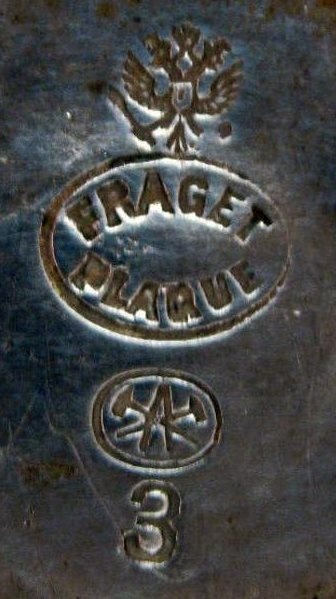 It consists of the inscription "FRAGET PLAQUE" ("FRAGET PLATE") inside the oval. 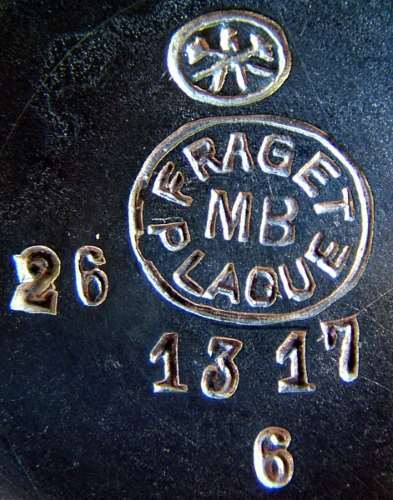 The lettering "MB" in the centre of the oval is the abbreviation for the French inscription "METAL BLANC" ("white metal" or Alpaca or Neusilber). That means "silver deposition onto the surface of Alpaca base metal". The size of the oval varies between 6.2 mm x 8.2 mm and 6.5 mm x 8.5 mm. Above the oval is the coat of arms of the Russian Empire - the two-headed eagle. Inside the small oval is the coat of arms of the coppersmiths' and bronze-smiths' corporation (two crossed hammers with a pair of compasses). 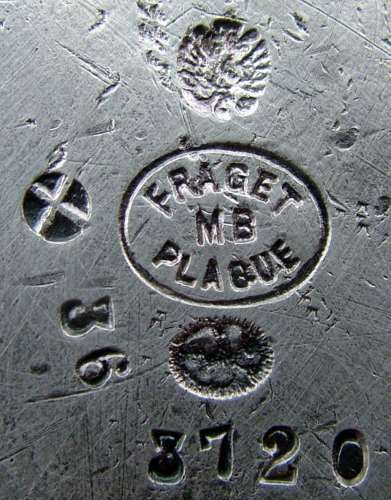 A variety of Fraget mark No.15 with the absence of the coat of arms of the Russian Empire. 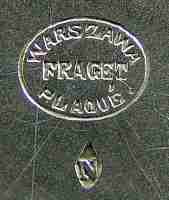 It was used since Poland became independent (in 1915). 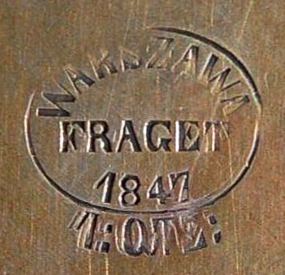 A variety of Fraget mark No.16 with the absence of the coat of arms of the Russian Empire. 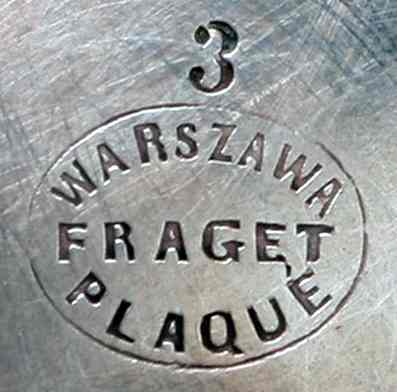 Again it was used since Poland became independent (in 1915). The size of the oval for the lower photo is 7.0 mm x 8.2 mm. Another later variety of Fraget mark No.19. 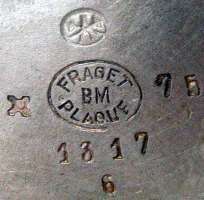 It contains the lettering "BM" in the centre of the oval (instead of the previous "MB" lettering). 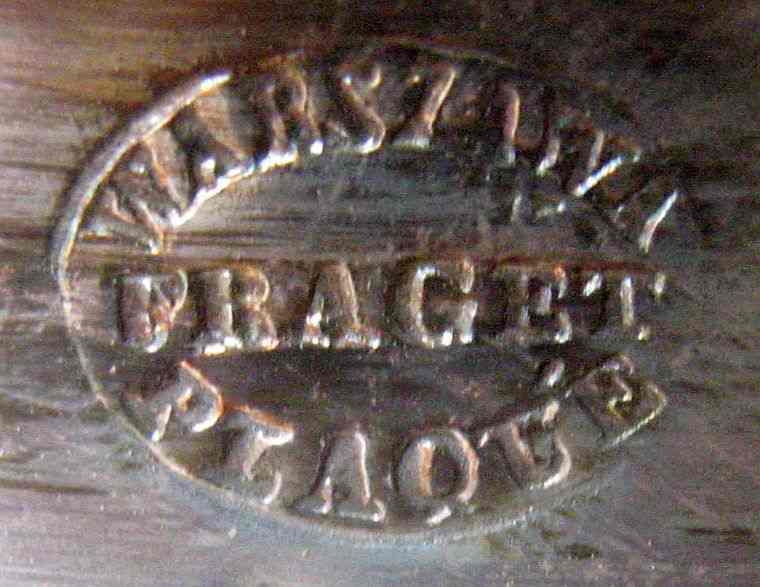 Probably, it is the same marking of Alpaca base metal, but in Polish, as the two letters "BM" could be an abbreviation for "BIALY METAL" ("white metal in Polish).